So which is it? North County? Or San Diego North? It was really confusing to me when we moved here in 2005 and settled in Carlsbad. Everyone referred to the area as North County, and until I looked into it I thought it was a separate county. I know it's not. So what does North County refer to?? What towns are included and which ones are not? I think this is still a confusing issue. But I have a general idea. I understand where it developed from. With the rapid growth of towns like Oceanside, Encinitas, Cardiff, Carlsbad, Escondido and other "suburbs" of San Diego following the 5 being built, and with many towns (also including Del Mar, Solana Beach) becoming incorporated beginning in the 50s, it became common to refer to the northern reaches of the county as North County. I recently read an article in the San Diego Magazine that talked quite a bit about this area and its growth. There is now a push to refer to the area as San Diego North to better link the region to the rest of the county. This push is coming from Cami Mattson Director of the San Diego North Convention and Visitors Bureau. The article talks about her branding of our region as an area for resorts such as those found in Santa Barbara and Laguna Beach (guess they are referring to places like Aviara and La Costa, to name a few). So the pressure for referring to the area as San Diego North is part of this branding effort, as I understand it. I don't know that it makes a difference. And it really doesn't matter to me. I am just getting used to calling the area North County so I'm not sure I can change that readily. And I'm not convinced it really will make a difference to the economics of the area - perhaps in the advertising. We'll see. So what do you think? Does the name North County confuse you? What about renaming the area? Do you even care? I'd love to hear what you think. Here is a tour I put together for Rancho Carrillo, a master planned community in Carlsbad in Southern California. It's not an area I know especially well, but it offers a well-planned neighborhood with a range of housing and prices, a neat historical park, a swim center, and some gorgeous views despite being inland by a few miles. If any one reading this has comments about this community, I'm sure there are some readers who would like to hear. Or perhaps someone who is planning a relocation, is considering moving to the San Diego area, and is looking at Carlsbad homes for sale. If you have any feedback on the tour, let's hear it! Have a great weekend. Need something to do - check out the local entertainment in San Diego. Do You Go to Farmers Markets? One of the neat things about living here is the benefits of going to Farmers Markets...year round. There are lots of them in the San Diego area. They are such a treat back East, because you only have them a few months out of the year, and while the produce then is terrific, at other times it is rather marginal. Out here I have discovered a number of markets in North County that I enjoy visiting, and buying produce and other goodies from. Carlsbad has a Farmers Market every Wednesday from 1 - 5 PM and on Saturdays from 9 - 1. They are located at Roosevelt and Carlsbad Village Drive. There is a great array of stuff here, including flowers, cheeses, granola, plants and on and on. There is a good market also in Solana Beach in the Cedros District (Cedros Street) on Sundays from 2 - 5 PM. I have been to the one on Vulcan in Encinitas (Leucadia) only once during the winter and there was not much to offer. But I suspect it was more the time of year than the quality of the market. Open on Sundays from 10 - 2 PM. If you don't go to any of the area's markets, you are missing a great source for terrific produce and more at good prices. The list of the best cities for jobs in 2007 was recently published by Forbes, along with an accompanying article. San Digeo dropped down, from #16 last year, to #30. Not sure of the details why, although with the low unemployment and the cost of living, and the slow job growth that the media has reported, I guess this is no big surprise. The city still ranks well in the list of the top 100. Yikes. What are they talking about here. A new number? A bunch of new numbers? When will this happen. WILL it happen? Yep, the California Public Utilities Commission's Telecommunications Division is looking into some changes since we are running out of phone numbers in the 760 area code. You have probably already heard about this, but perhaps not. I have been through this before when I lived back east. And I'm kinda surprised this has not come up out here til now. One of the changes we went through (actually a couple of times) was to add new area codes in the Boston area - this happened more than once. It took some getting used to. But another thing that happened at a different time was we were then required to enter the entire number (including area code) even when dialing within the area. Now that was weird. But we got used to it. 1+area code+7 digit number. So then I came out here and, lo and behold, I just dial my 7-digit number...no 760 needed (although every now and then on my cell I need to use it). I still have a tendency to add the 760 from time to time. Guess it's for practice. Well, a planning meeting was held in October 2006 and as a result they established public meetings - there is one in Carlsbad being held on the 21st of this month. It appears there are a couple of options that they expect to issue a decision on at the end of 2007 - one option is to add an area code, 442, and they will decide which side of the split line gets to keep 760 and which gets the new number. You can read more about the proposed changes and questions on the CPUC site. Here's a tour I did of Encinitas Ranch, an upscale and fairly new development in Encinitas with its own golf course (public, BTW, and I hear it's quite good...but I'm no golfer). I'd love your feedback and comments. 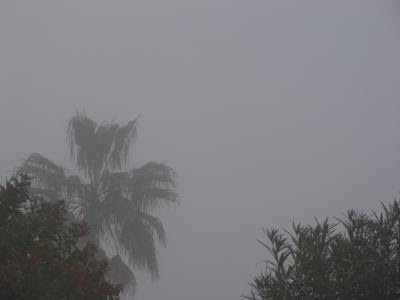 Today is one of those days when I am totally thrilled to be here in Southern California. 76 degrees here...and back east it is in the 20s with snow (talked to some friends today - tried not to gloat TOO much). Have a fabulous weekend - I understand it should be even warmer tomorrow - good day for a bike ride. Can't wait. 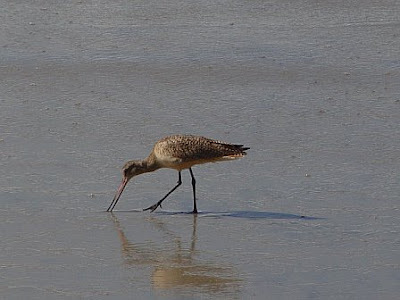 BTW this bird was on the beach at Moonlight Beach, not at Encintias Ranch, but I liked the pic. I really like Leucadia, about 30 miles north of San Diego. The beaches are beautiful, the community has a rustic beach-town charm to it, and it is a short drive from my home in the La Costa area of Carlsbad. Grandview Beach is a favorite for walks and enjoying the sunsets. I just did a write-up on Leucadia, with some photos and a virtual tour, so stop by and take a look. You might fall in love too!. The weather here can be strange, but I still really like it. Guess I'm still adjusting from the weather we used to get back in Boston. Yesterday for example. I had to go to a meeting in Carmel Valley. It wasn't raining where I live in Carlsbad nor did it look like it was going to, but I ran into wet roads in Del Mar (no rain, but the drivers were still acting like we were in the midst of a downpour...so typical). Then I had to run to San Marcos to show some properties after lunch, where it was sunny and clear. On the way back to Carlsbad I ran into the tail end of a shower but nothing to brag about, but got home and my wife said it had been pouring rain for 15 minutes, then suddenly stopped. This sort of thing seems to happen regularly (well, when we get rain, which is rare). While it was odd, the nice thing is that we did not have an entire gray day of rain (or week of rain) as it used to do so often in Boston. And despite this, I sure am glad to be here, and not back there, or in the mid west...or worse, upstate NY where they have had more than 9 feet of snow in the last week or so in some areas. Yep the weather here can be strange but I sure enjoy it. And today, Valentine's Day, is barefoot weather. I love it! 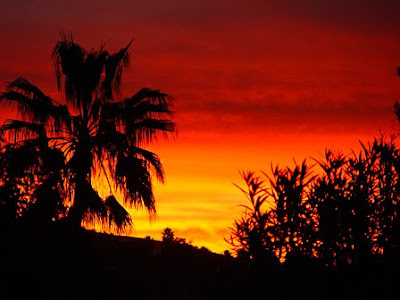 Last week we had a gorgeous sunrise one morning - see the pic above that I took from my backyard. And then the next day the view was completely different (see on the right). And people back east say - don't you get tired of the same nice weather all the time in Southern California? Yesterday I discovered a couple of great places to poke around in if you are an antiques shopper. They are both good for simply enjoying the stuff that is out there for sale, but also for hunting down collectibles, furniture, jewelry, glassware and other things us antique lovers like to look at and buy. In Oceanside - check out Coast 101 Home and Garden, located at 1828 S. Coast Highway. Stop in and ask for Ann - she's the owner and she has a wealth of information, and will help you find what you need. And she's great fun to talk with . They can be reached at (760) 757-1257. There are several other fine stores nearby as well. In Carlsbad, north of the village - visit Amie's Antiques Mall. There is a wealth of stuff here, from many vendors. You can buy, sell and consign. Lots of other antique and consignment stores right in the same area (I still need to check those out). Amie's is located at 2825 State Street. Call them at 760-730-004. Check out this site for a guide to thrift shopping and more in San Diego. Did You Ever Get A Monk-E-mail? Have you ever gotten a Monkey Mail (Monk-e-Mail)? Would you like to send one to a friend, family member, coworker? It's easy, fun and FREE (yep, that the best part). Visit this site and select your monkey, clothing, accessories and more. Then you can record your message over the tlephone (there's an 800 #). Once recorded, you save it. Then you can send the email. Kids will love it. Your friends in the office will laugh. Surprise your spouse on Valentine's Day. Use your imagination. Enjoy! How Do I Rebuild My Credit (guest blog)? One of my guest bloggers, a good mortgage friend of mine, just added a post on a way you can rebuild your credit (I expect we will hear more on this too). The value of Feng Shui centers around health and well-being and the opportunities that arise as a result of living within a supportive environment. In truth, some houses are just naturally better and more beneficial than others. The good news is, however, there are easy things that you can do to create a more supportive home (or listing) for the months/year ahead. Keep it real: Open up your home every day and let the fresh air cleanse and revitalize the indoor energy. Studies show that the air contained within our homes can be more polluted than the outdoor air. Many houses rely on forced air/heating systems which don’t allow for proper ventilation. Consequently, these closed up environments suffer from humidity relating to climate, cooking, and even breathing, which can attract mold and mildew and lead to illness. Another solution (and selling point) is to have operable windows that enable you to manage air flow and circulation. You can also monitor your indoor air quality by purchasing an inexpensive test kit available through companies such as Envirologix. Feng Shui Staging Tip: Open up all the windows/doors within a listing prior to an Open House. (Keep the house open for a minimum of 30 minutes, ideally longer.) This will reinvigorate the energy within the house giving it a fresh, vital feeling. Let there be light: Natural, unfiltered daylight and sunlight are healthy additions to any environment for a variety of reasons. First, natural exposure enables a person’s internal clock to monitor the variation of light and color throughout a given day (and throughout the seasons) which provides a direct connection to nature. Sunlight has also been proven to be good for the human psyche. Avoid harsh indoor lighting, whenever possible, because it can be depleting on your system. I’m a huge advocate of dimmer-switches which enable you to change and enhance lighting easily, depending upon the room and the function of the space, to go with the flow and cycle of nature. Have ample illumination indoors and outdoors—along stairways, hallways and around the perimeter of your home/property. If you have to go with florescent or incandescent lighting, choose a compact florescent light (CFL) bulb which uses 60-75% less energy and saves 300 pounds of carbon dioxide a year. Feng Shui Staging Tip: While you’re opening up all those windows and doors also open up the curtains and blinds to take advantage of natural sunlight. Windows, particularly those with views of lush landscaping and open space, are excellent selling features and serve as “living art work.” (More on this topic below.) Surprisingly, most of the listings I’ve seen while on a Caravan/preliminary walk-through have kept window treatments closed. Keep the connection: Bring the outdoors in simply and naturally through windows and doors that feature beautiful views and colorful landscaping; open atriums; indoor/outdoor courtyards, even comfy window seats that allow you to read, watch nature and relax. Skylights offer natural light and help to cut down on energy use. Roof tops, balconies and high loft areas can serve as observation decks to view the phases of the moon, planets and stars. Feng Shui Staging Tip: Stage your listings to suggest and reflect nature. Other ways to create visual harmony includes the use of natural materials, colors, and organic shapes in your interior design. (Use “soft, curved, and flowing” as your inspiration rather than “straight, cramped or sharp.”) Flooring such as bamboo, cork, or natural fibers like sea grass or sisal is superior to and healthier than traditional carpeting. There exists a universal attraction to and appreciation for the beauty of nature—it connects all cultures. In terms of resale value, homes that incorporate natural elements throughout it are consistently more desirable and sought after and usually receive a higher asking price. Stay tuned for more Feng Shui Basics. I mentioned a short time ago that I was going to be having some guests on my blogs. So I wanted to let you know that Kathryn Holt, a highly regarded Feng Shui expert, will be spending some time here and on my others blogs sharing her knowledge with you. Many people don't know much about Feng Shui, or have misconceptions about it - myself included - and since it interests me I wanted to share. If it's new to you, keep an open mind. And if you already are familiar with Feng Shui, perhaps you will learn some new things. I hope you will enjoy her writing, and I know she welcomes any and all questions. I've mentioned before that I live in Carlsbad. I love Carlsbad, but I'm biased. I have put together an extensive marketing piece for buyers and sellers, using a series of virtual tours and other information, and would like to share it with you. Buyers will get a good idea of what life is like here in Carlsbad. And sellers will get a chance to see some of the marketing I do. And you get to enjoy the views and perhaps learn more about this thriving community. So, take a tour of Carlsbad - click on the surfboard and surf away. BTW each tour has music so turn up your sound and enjoy. And I'd love your feedback, if you have a moment. Just a little humor for cat lovers. Had to share this (and there is more) from my daughter. Too funny! This is a cat listening to Stevie Wonder. I am in the process of inviting some guest bloggers to share their thoughts on a variety of real estate related topics and other things. Stay tuned - I'll let you know who they are. Chris Comer from Pacific Capital Mortgage just posted a market update on my First Time Buyer Central blog. Stop by and take a look.